I can tell by my watch that it’s salmon season! Well, okay. Not exactly by my watch. But by the fact that the harbinger of the seasonal openings–Copper River–has launched and that means that commercial openings begin peppering the region, bringing in freshly-caught wild salmon from throughout the Northwest. What a happy time of year! I have yet to have my first bite of Copper River’s 2010 vintage but surely it won’t be long now…..
Another timely salmon note is that a sandwich I helped create for Burgerville has just launched in all 39 of their restaurants this week. The Grilled Wild Coho Sandwich will be on menus until July 5 (or as long as supplies last), the simple and tasty item sandwiches herb-sprinkled and grilled coho fillet on a Kaiser bun with lemon aïoli and frisée. They tell me it’s already selling “gangbusters”!! Which is GREAT because proceeds from each sandwich go to support eat.think.grow, a program in Portland that’s working to establish an edible garden at every school in the city. No small task! But one that I’m thrilled to support. I met the founding director Linda Colwell at the IACP conference in Portland last month, we both attended the highly inspiring Urban Farm Mini-Symposium. So glad to have met her there and learned about eat.think.grow, just in time to be able to support them through Burgerville’s generous program. And Linda and I discovered we both went to La Varenne too! Small world. So the third confirmation of salmon season came this morning by way of email from a fan! She said that one of her favorite recipes of mine is the Grilled Salmon with Cardamom-Peach Chutney and she’s misplaced the recipe. And with salmon season upon us, wondered if I couldn’t share a copy of the recipe with her so she could recreate it a few more times this summer. Not only will I do that, but I’ll go ahead and share it with all of you! Hope you like it. And if you might be in the mood for grilling a whole salmon, here’s a post I did last year on that subject. I seem to have a thing for chutney. At a book signing recently for my latest book, Gourmet Game Night, the folks at Metropolitan Markets had whipped up the Aged Cheddar with Dried Cherry-Almond Chutney recipe to entice passers-by. Everyone loved that chutney! So much so that every other person asked where they could buy it. (Sorry, ma’am, I’m just a cookbook author; you’ll have to make it yourself. Though now that you mention it….) And in that book, too, I made a rhubarb chutney that goes with sliced pork tenderloin for a little open-faced sandwich. So this recipe below only proves that I may be in something of a rut when it comes to falling back on chutney as a complement in many of my recipes. But what’s not to love? I’m usually not a fan of fruit or sweet things meshing with savory, but chutney (the way I like it at least) has such distinctive savory tones with spices and onion and vinegar, that I’ll forego my savory-fruit prejudices. This recipe doesn’t actually come from my Salmon cookbook, but instead my Stone Fruit book. In fact, I bet this preparation would be delicious with any of the stone fruits. Mmmmm, plum in particular. I may have to try that one myself here soon. For the cardamom-peach chutney, combine 8 of the cardamom pods with the coriander seeds and cumin seeds in a small, dry skillet and toast them over medium heat until lightly browned and aromatic, 2 to 3 minutes. Transfer the spices to a spice grinder or a mortar and pestle and finely grind or crush them (the cardamom pods are flavorless and are perfectly okay in the spice blend). Set the spices aside. Peel and pit the peaches, then cut them into 1/2-inch pieces. Heat the oil in a medium skillet over medium heat. Add the onion and ginger and cook, stirring, until fragrant and the onion is beginning to soften, 3 to 5 minutes. Sprinkle the spices over and stir to evenly coat the onion. Add the peaches with the vinegar, red pepper flakes, and remaining 6 cardamom pods. Reduce the heat to medium-low and cook, stirring occasionally, until the peaches are tender and the chutney is thick and aromatic, 25 to 30 minutes. Don’t stir the chutney so much that the peaches become a purée; the pieces should hold their shape somewhat. Season the chutney to taste with salt and set aside to cool. The chutney may be made a few days in advance and refrigerated, but let it come to room temperature before serving. Rub the salmon pieces with the oil and season with salt and pepper. Lightly brush the grill grate with oil, set the salmon on the grill (flesh-side down first, if using fillet pieces), and cook until just a touch of translucent pink remains in the center, about 3 to 4 minutes per side, depending on the thickness of the fish (or longer, to suit your taste). Set the salmon on individual warmed plates, spoon some of the peach chutney alongside, and sprinkle the cilantro over all. Serve right away. I guess it was two different influences that conspired to establish our menu for dinner last night. First, the Sunday trip through our beloved neighborhood grocery store, West Seattle Thriftway, where my eyes caught a “buy one, get one free” special on beautiful, boneless rib-eye steaks from Misty Isle Beef. Couldn’t pass that up, no way! That same evening, we were chatting with a friend about random things in life and travel came up. “What’s on your wish list right now for one of your next trips?” she asked. Hadn’t thought about that lately. We have a lot of travel coming up this year–South Carolina, Santa Barbara, Italy, France–so what might come next hasn’t come up yet. But after a second or two, I blurted out “Argentina!” It’s maybe not next on the list, but I sure have a growing hankering for making a trip to Buenos Aires, having hear two different sets of friends rave about their trips there. And this friend, too, had been and echoed that the city’s like the Europe of yesteryear, and less expensive, great food, amazing architecture, on and on. Next thing you know, it’s Tuesday and I’m considering what to serve with those rib-eyes. Must have been lingering images of Argentina that brought to mind chimichurri sauce, the traditional herb-garlic-vinegar concoction that is a classic complement to grilled meat (which seems to be the national food of Argentina, one particularly good reason to make the trip!). 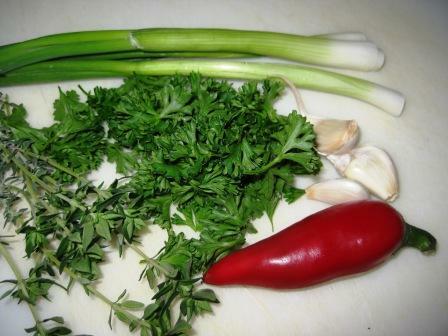 Parsley is the traditional backbone of chimichurri, often with an accent of fresh oregano as well. Parsley’s not abundant yet in my garden, but thankfully had a bundle of parsley left from the weekend, so finely chopped most of that. (Yes, that’s curly parsley in the photo, I usually get flat-leaf. But the husband was on that particular grocery outing and I failed to be specific!) No oregano sprouting outside yet either, but I snipped a few sprigs of really tender new thyme. And while I was out there, some lovage just for good–and green–measure. Green onions and garlic minced. Same for a red Fresno chile I happened to have on hand. A few good glugs of red wine vinegar, and a moderate glug or two of olive oil. A big pinch of salt and a few grindings of black pepper. 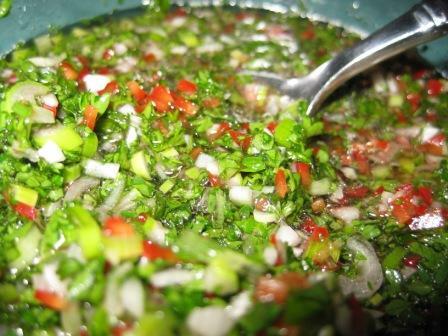 No time flat, I’ve got a lovely, vibrant, aromatic chimichurri just waiting for some grilled steaks to party with! What a tasty dinner that was. There are a slew of bright flavors in the chimichurri–herbs, vinegar, garlic, chile–that serve bold contrast to the richness of the meat. It wakes up and engages your palate with each bite in a way that A-1 (another personal favorite) just can’t replicate. We ate up pretty much that whole bowl’s worth, a little bit of which was brushed on some sliced eggplant that I grilled alongside the steaks. Mmmm, mmmm, mmmm. 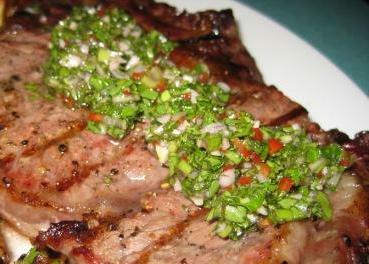 And I guess I’ll be on a minor chimichurri kick now until I get down to Argentina myself and try some at the homeland. Can’t wait. Great minds think alike, don’t you agree? 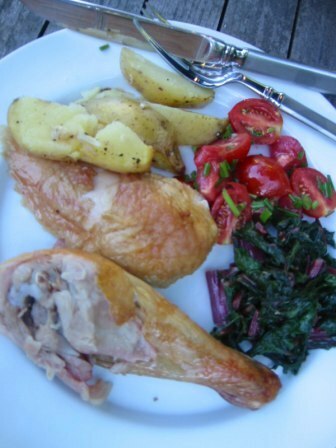 My food-writing cohort and friend Nancy Leson spelled out a few days ago–in delicious detail–the steps she (and her husband Mac) uses to turn out perfect whole chicken roasted on the backyard grill. I’d served at home last Saturday night very much the same thing. Minus the Lawry’s Salt (though I do have a bottle on my shelf) and using a brine instead. As I’ve mentioned in the past, a classic (oven) roasted chicken is a staple in this house, some nights absolutely nothing could taste better. But with heat like we had last week, no turning on the oven in this house. Grill-roasted chicken it was. Like Nancy, we’re Weber kettle grill folks in this household and also swear by the chimney contraption to perfectly get the coals a braisin’ without using that awful lighter fluid. When the coals were good and ready, I spread them to opposite sides of the grill, in slender piles right up against the side of the grill. I also made a foil pan (triple layer, fold up the edges; or buy a foil pan at the store) to put between the coals. The chicken’s going to drip fat during cooking, this just helps tremendously with clean-up. 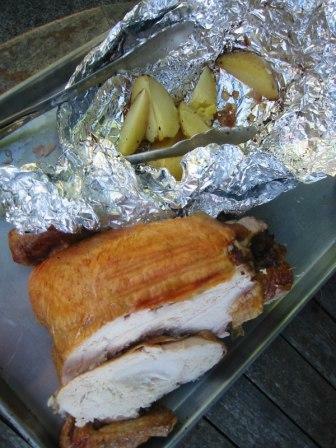 After taking the chicken from the brine, pat dry and set it in the center of the grill grate, right above that foil pan. Set the vents each about half-open, cover, and make a gin and tonic. Or open another bottle of Chinook rose. Or both, in succession. I don’t fiddle much with the bird while it roasts. It keeps the leaner breast meat farther away from the heat of the coals and avoids tearing the skin. I did turn onto the breast about halfway through for 15 minutes or so, just to amplify the crispy-brown character of the skin. One important point is that the coals will likely need some replenishing along the way. And don’t wait too long; consider that a handful of new coals added to the glowing ones will take a good 20 minutes to kick in. Hopefully your grill grate has those little hinged openings; just lift them up and scatter 5-7 coals on top of the existing ones. After that, you deserve another glass of wine. Also on the menu, some grill-roasted potatoes. I cut some Yukon Golds into big wedges, tossed them with a little melted butter, sliced garlic and salt and wrapped in a couple layers of foil. They went on the fire after about 45 minutes; also in the center, if possible, away from direct heat. The menu was rounded out with a simple tomato salad, tossed with regular chives and garlic chives from the garden, in a simple vinaigrette. And red chard that I quickly sauteed with garlic. A colorful, delicious, aromatic, relaxing meal to have out back on the cool patio on one of Seattle’s longest and hottest days.